Launceston's Womens Institute. | Launceston Then! 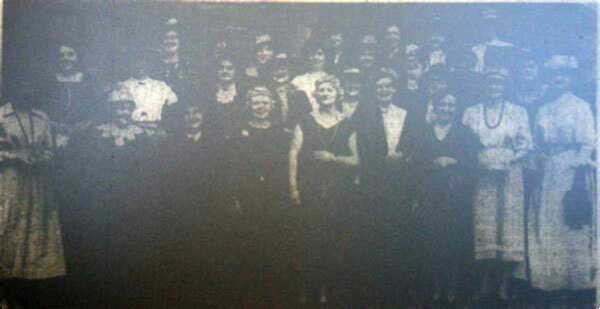 Launceston WI at there Golden Jubilee dinner in 1969, wearing period costume. Launceston’s Women’s Institute is nearly upon its centenary having been formed a year after the First World War in May 1919 and they are still going strong, meeting every second Tuesday of the month at the Eagle House Hotel. What follows is the ‘Cornish and Devon Post’ report of the inaugural meeting and of the first gathering of the Institute once formed. It has long been felt at Launceston that an institute for women was needed in the town. Accordingly the promoters were successful in arranging a public meeting for Monday and in getting the services of Mrs. Clowes from headquarters in London to explain the scheme. The Mayor, Dr. W. F. Thompson, presided and said he took it the Institute, if started, would be a centre for women to meet socially and would be nonsectarian and non-political. Mrs. Clowes said Women’s Institutes originated in Canada and were so successful that the Board of Agricultural adopted them as a method of rural development and education. In Cornwall today (1919) they had 16 such Institutes. It was just a meeting together of all women of one place with one idea – “How can we make the place in which we live the best place in all England?” Certain portions of the meeting were educational; all sorts of subjects being brought up for discussion. In the Institutes they tried to find out the best everyone knew, put it together, and used it for the common good. In the development of co-operative enterprise they had undertaken many things, one of the largest being the market schemes and the encouragement of the local industries. They also studied home economics, for there was so much they could learn in their homes, and one of the finest things they could learn was to be homemakers. As they went about England they were struck with the ability and capacity of the older women, who kept their homes so beautifully, and in the Institutes they showed the younger people that they could learn a great deal from their mothers, and even from their grandmothers. People were afraid that the Institutes would take people from their homes, but one of the finest things for women was to meet once a month on the common ground of friendship, and discuss things which would interest them more in their homes. They always bound themselves together to be friendly, sinking everything that was not of a friendly nature, and trying to think the best of one another. They wanted to find in the home the centre of their work, and find out how best they could work in their homes for the good of their country. Mrs. Haworth said she thought the scheme was very good, but they would not like to embark on anything if they could not carry it forward, and she would like to know a little more about the financial side. Mrs. Clowes said 25 women could form an Institute. In Canada many women came 40 miles to the Institute, and in her own village the most regular attendant came 4 miles to every meeting. There was a little group of five cottages, and one of the mothers would stay at home to look after things while the others went to the Institute. Now that the men realised what a good work the Institute was doing, they stayed at home to look after the children, and let all their wives go to the Institute. (Hear and laughter). About every three months they had a men’s night, when they invited their husbands, and they saw then that the women did not meet to play, but to do good work. Mrs. Harcourt Williams, who mentioned that the County Council had been very good in providing them with speakers and lecturers, said in Truro at first they did not worry about the district around, but just started in Truro itself, and since then several of the other places around had applied to have an Institute started. Rev. Smith-Pearse said if by starting in Launceston they could hope to see it extend in the country districts, it would be an untold boon. Mrs. R. Waddon-Martyn said Mrs. Lethbridge had written suggesting they should have a room in Launceston on Saturdays as a rest-room for people who came in from the country. Mrs. Lethbridge was willing to help in every way, and others had written to the same effect. A resolution in favour of forming an Institute in Launceston was unanimously carried, and the following were elected a committee, with power to add: Mesdames R. Waddon-Martyn, Wenn, T. Symons, Orchard Sharp, Steele, Haworth, Thompson, M. Tremlett, Spry and Miss Marian Nicolls. That then was how it all started and here is how it continued with the first meeting of Launceston’s Women’s Institute held in the Oddfellows Hall. The Mayoress, Mrs. W. F. Thompson, in opening the proceedings, said that in the Institute, they were combined for every social improvement. The best of them knew they needed improvement, the most clever of them would like to know more, and in the Institute they met on a common platform. In the last few years they had learnt that they had a magnificent Empire, and they might well be proud to belong to it, and each one should desire to still further improve it. Members of the Institutes could increase food production by increasing it in their own little communities; they could learn how to manage food supplies better in their homes, and so save food and money; they could learn how to save strength and time in their work, and concentrate their best care on the upbringing of their children, the little inheritors of their wonderful Empire. It should be their privilege to give themselves up to these and other services, so that the result would be better homes, better communities and a better country. Mrs. Alfred Martin (Voluntary Organiser, Cornwall) followed with a short address and answered several questions, after which Mr. Bluett (Truro) gave an interesting lecture on “Cornish Folk Lore.” No less than 63 members were enrolled, and at the same time tea was handed round, and suggestions dropped into the suggestion box. Songs were rendered by Miss Ethel Bailey and Miss G. Bates, and a recitation given by Miss Dorothy Dingley. Much interest was taken in the collection of curios and needlework. The Institute Committee, with its officers, now stands as follows: President, the Mayoress; vice-president, Mrs. T. Symons; hon. Treasurer, Miss Marion Nicolls; hon. Secretary, Mrs. R. Waddon Martyn; committee, Mesdames Haworth, Wenn, A. Brimmell, Dingley, Spry, Orchard Sharp, M. Tremlett, Misses Wellington, McDonald, and W. Wise.